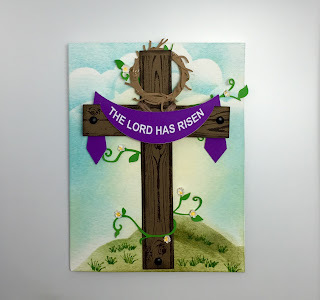 My Easter Cross card is a fusion of mediums using ink, stamps and the CAMEO to design and cut several pieces for the card. I started by using watercolor paper to create the background of the card. I used Tim Holtz Distress Inks and Stampin Up Classic Ink Pads to create the hills and sky. I used a stencil I created with the CAMEO for the hills and sky, using the Tim Holtz Blending Tool to achieve the look I was going for by blending several colors of ink to add depth and richness to the background. Next step was to modify my design shapes in Silhouette Studio to fit my card. I assembled my card adding finishing touches of grass using Kittie Kits by Kittie Caracciolo. Watercolor paper cut 4.25 in. x 5.50 in.